Ideal gift for a little to keep entertained for their pram or car seat etc. Bright Starts Pretty in Pink Shimmy Shakers are easy to grasp friends with textured materials and bright patterns that will interest baby and aid development. Shimmy Shakers stretch out when pulled and vibrate all the way back to normal. 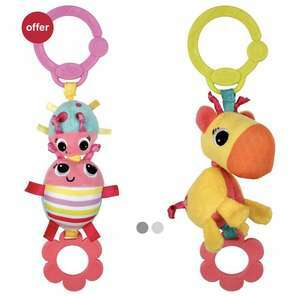 They have a teethable pull ring, multiple textures, and bright patterns are perfect for babys playtime entertainment. A convenient Fun Link attaches to carriers, strollers, and more so that the fun never ends! It’s working again, 2% off quidco too, not much but every little helps.